The Radio Dept. is a Swedish pop band signed to Labrador Records. They have released three full length albums, and a series of singles and EPs. The band originated in Lund, Sweden. In 1995, The Radio Dept. was formed by Elin Almered and Johan Duncanson (who were old school friends). The name was taken from a gas station/radio repair shop in Lund, Sweden, which had a large sign with the name Radioavdelningen, ("The Radio Department" in Swedish) hanging outside their shop. Since 1995 members have been coming and going and at some points there has never really been a Radio Department at all. In 1995, The Radio Dept. was formed by Elin Almered and Johan Duncanson (who were old school friends). The name was taken from a gas station/radio repair shop in Lund, Sweden, which had a large sign with the name Radioavdelningen, ("The Radio Department" in Swedish) hanging outside their shop. Since 1995 members have been coming and going and at some points there has never really been a Radio Department at all. Martin Carlberg and Johan Duncanson started playing together in 1998 and decided to use the name The Radio Dept. Since then the band has done lots of gigs and lots of recordings. The Radio Dept. recorded 4-tracks in friends' living rooms or at home, in smelly warehouse, in demo studios with blinking fluorescent lightning and at schools. Original band member, Elin Almered, left the band before the recording of The Radio Dept. 's debut (lesser matters), but still made an appearance singing vocals for "Strange Things Will Happen". Per Blomgren, Drummer, left the band before the release of Lesser Matters. The band opted instead for digital assistance with regards to drums & percussions for their songs. Lisa Carlberg, bassist, departed from the Radio Dept soon after the release of "This past week EP". The band no longer felt the need for a member that solely specialized in bass. The band was taking a new direction and preparing for their second album, "Pet Grief", which wouldn't require a member that played bass guitar. Johan Duncanson (Guitar & Vocals), Martin Carlberg(Guitar) and Daniel Tj?der (Keyboards & Synth) (2006). More details can be found on the radio dept. website: theradiodept.com. Created in 2001, this is the Radio Dept's original label. Created & managed by the band themselves. They published and distributed their own recordings in order to spread their music to the world. The "Against The Tide EP" & coveted "Annie Laurie EP" were both released on this label in 2002. At sporadic moments over the years, whenever the band have wanted to release something quickly or for free, they'd do so through the Slottet label (e.g. bachelor Kisses in 2008). After the success of the self released records and some glittering reviews in local publications, several major labels came calling. The Radio Dept. rejected most of these offers and instead signed with Labrador records. 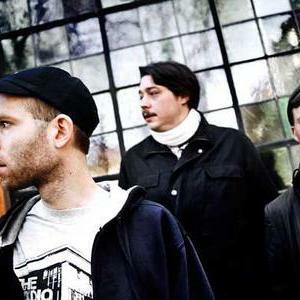 Although the band don't consider themselves connected ideologically or musically with Labrador and the other bands on the label, they have much respect for the label which has officially become the home of The Radio Dept. Shelflife are an american indie label that operate on a similar philosophy to that of Sarah Records. They select highly innovative, creative & melodic bands and offer them transatlantic distribution. Several labrador bands had achieved success through shelflife, so it seemed an obvious choice to use them again for the distribution of 'Lesser Matters'. No futher Radio Dept records were released through shelflife. Rex records was an London based experimental indie label started by an ex-XL employee. The aim was to release demos and promote leftfield indie music. Only two Radio Dept. records were released on Rex, Why Won't You Talk About It and the rare Liebling 7". During 2004/05, XL funded, distributed and promoted The Radio Dept. During this short partnership 4 records were released. Lesser Matters, Where Damage Isn't Already Done, Why Won't You Talk About It? and Ewan. A short european tour was organised for the band as well as lots of press and an appearance on an XL compilation with the likes of Ratatat & MIA. Track & Field are another London based record label that took a chance on The Radio Dept. In 2006 Track & Field were employed to distribute Pet Grief in the UK. They also promoted the band and planned for an extensive UK tour. This plan was abandoned and a series of special one-off London shows were organised to supplant the tour. After years as an experienced distributor of DVD's & kids toys, Pony Canyon, tried their hand at promoting & distributing indie records. So far they've only distributed a special edition of Pet Grief in Japan. Three tracks by the Radio Dept. have been featured on the Sophia Coppola's film Marie Antoinette (2006). They are: Pulling our Weight, Keen on Boys, I Don't Like It Like This.